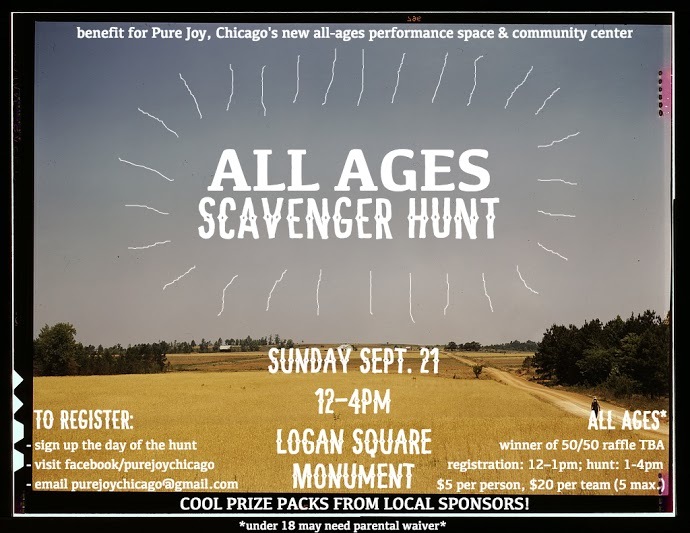 Pure Joy, the all-ages performance space and community center that’s been in the works for several eons now, is hosting a scavenger hunt to benefit the space. Throw a little cash into their coffers and compete for fabulous punk rock prize packs this Sunday at the Logan Monument. Show up at the moment by 12:30 the day of the race to register your up-to-five-member-team ($5 per person, $20 max per group) or pre-register here. The race will start at 1:00, end at 3:00pm, and from 3:00-4:00 they’ll be announcing the winners of the hunt and the raffle. All ages venue space is so important! Check the Facebook event out here!